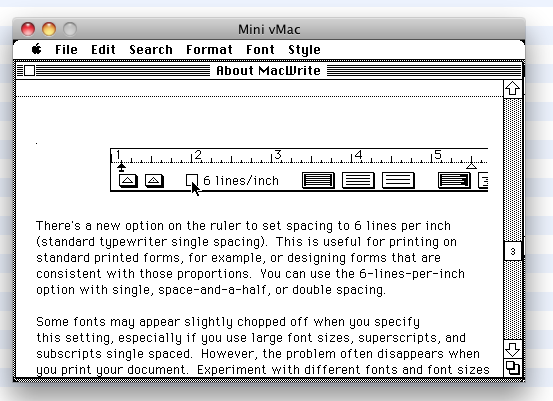 I have about 10 or so old MacWrite files that were written in the 1980's (so probably MacWrite 4.5 or so, but I don't remember for sure). I'd like to recover them. Looking into ways to do that, I find that there is no easy known way to do this. So it occurs to me that someone in the community is more of a packrat than I am (or has more room to store old electronics gear) and may have a working old Mac ca 1989 or 1990 with a version of MacWrite that could read these files. If so, I'd appreciate it if I could email said person the files and get either RTF, MS Word, or .txt versions (Preferably the latest possible Word format that can still be read by modern versions of Word or Pages). These files are a manual for an old Mac program I wrote in the late 1980's. I've gotten interested in re-writing the program in Cocoa for current Macs mainly as a way to teach myself Cocoa programming, but with a view to releasing the final product as a freeware program, including the manual. This is not sensitive data, and I have no problem using email for transferring this data back and forth. cool… here is a screen shot of System 2.o running MacWrite 4.5 running on Snow Kitty. seems like there weren't many features for a 4th and a Half revision of the werp. the text reveals that it was a different time. typewriters… maybe I want one of those just for the oddness of the machine. @johnfoster: thanks. I tried OpenOffice before posting this question, but could not find the MacWrite format in OpenOffice, even though the link you provided suggests it should be there. I think the emulation approach looks promising. I actually got it working, but I guess I need a way to create disk images onto which I can copy my files; seems to be no way to just get them from my Mac's file system! Any ideas? this link describes a way of getting files to an disk image. Also, I recently picked up a really old Mac for $25 that I haven't even tried to boot yet. I'll try this afternoon and if it works, I could convert them. OK, I finally got around to plugging it in and booting and IT WORKS! I am totally amazed. Bought it a month ago and it sat in my trunk the whole time. Plugged it in and it runs and MacWrite loaded right up. It even knows the date and time. Anyway, I am more than willing to try to convert the files, but I don't know how to get anything in or out of the machine other than the disks, which I no longer have anything that can read or write them. Cool! Getting the files into the old Mac is going to be a bit of a problem, I think. But if that machine has an internet connection, it may be possible to ftp them over from files I email to you. If you don't have an email address you're willing to share on here, do you have a LinkedIn page? If so, send me (at Kim Helliwell) a LinkedIn invite. I can send you one of the files to see if you can get it onto the old Mac. If that works, I can send the rest. No internet/ethernet connection at this point. I'm exploring how I would accomplish that. I have a USB floppy drive. you can send me the files I will copy them on to the floppy. after that drop the disk in the mail. however, I don't know if it will write 800k flops. And the drive on this Mac Classic II is a 1.44 MB. I have also found out that I may be able to convert the files on my G4 using Apple Works.